A Video “Mount Rushmore National Monument & Chief Crazy Horse Monument” tells about these two sculptures and their creation. 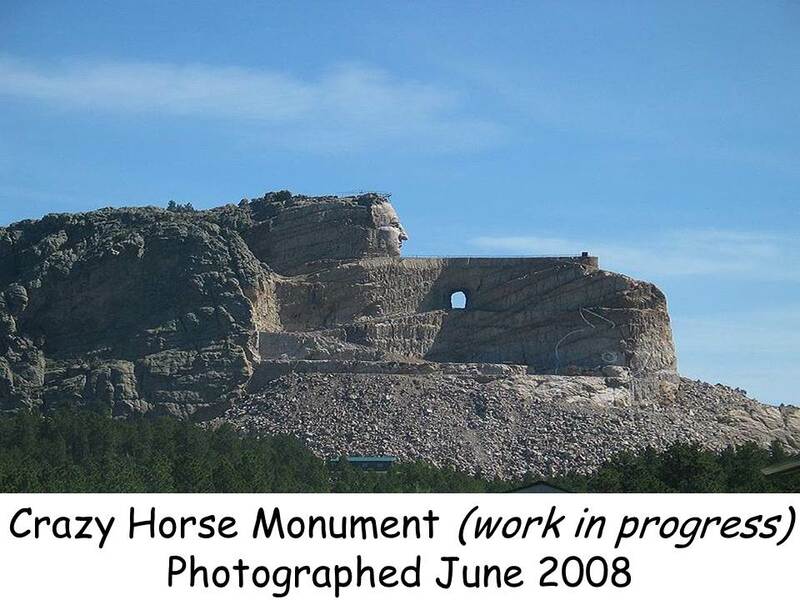 The Chief Crazy Horse Monument is still being finished. 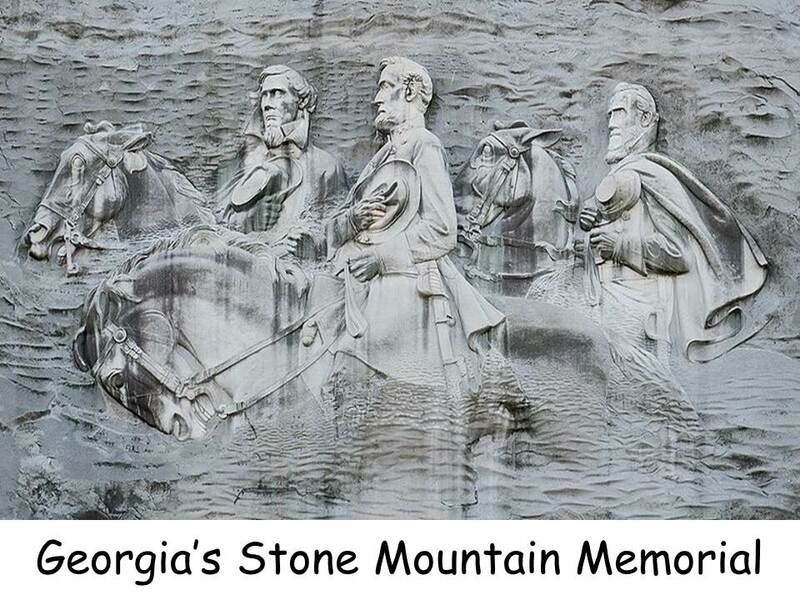 There is a booklet included in the Packet, which tells the story of Stone Mountain but there is no information about it written here, other than the fact that Gutzon Borglum began the project and then abandoned it. 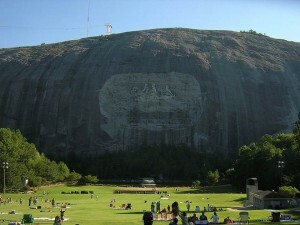 No sign of Borglum’s original work remains on Stone Mountain today. However, it is generally agreed that Borglum made a most vital contribution to the fact of the Stone Mountain Sculpture being there at all. This is because it is doubtful that any other sculptor would have had the imagination to visualize such a colossal monument, in such an inaccessible location, or have had the nerve to begin carving it in the first place. 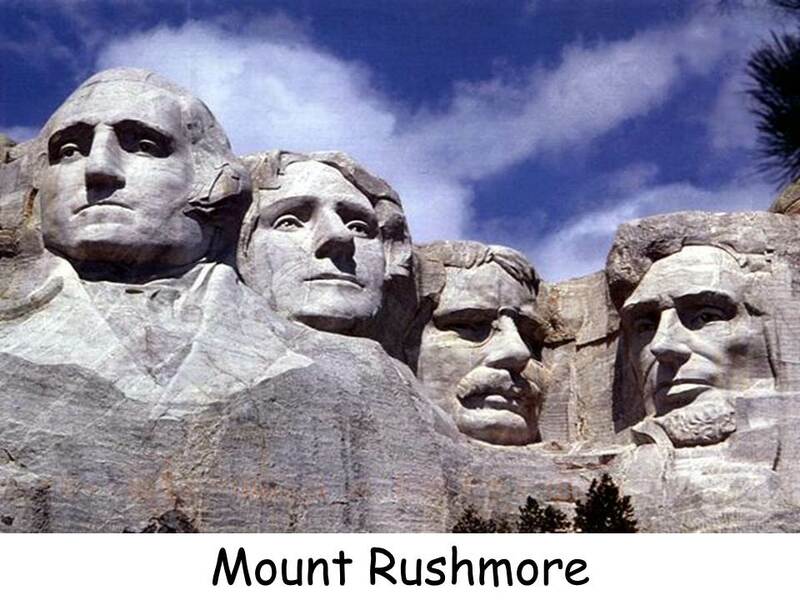 Mount Rushmore and Stone Mountain are HIGH RELIEF sculptures because they are attached to a background, the mountain. They are also examples of SUBTRACTIVE SCULPTURE, because material was taken away from these mountains when the artists formed them. Eventually, Chief Crazy Horse will be the largest FULL ROUND SUBTRACTIVE SCULPTURE ever created. The Lincoln Memorial is a SUBTRACTIVE SCULPTURE but it is also a FULL ROUND sculpture—a statue that is freestanding. Your presentation may target the general idea of monumental sculpture and include all or part of these sculptures. You may also concentrate on just one monument in more detail. Be sure ALL 5 pictures AND video are returned to the Packet Carrier after your Presentation is finished. “I don’t like anything puny,” he said—so he carved four giant heads on a granite mountain. Geologists say the faces, sixty feet from chin to top, with noses twenty feet long and mouths eighteen feet wide, will still be there 500,000 years from now. The Mount Rushmore Memorial was a gift to the United States from a man who had found his talent for art while he was a boy at school. Gutzon (GOOT son) Borglum was born in a log hut in Idaho on March 25, 1867. His parents had arrived from Denmark just three years earlier. In 1874, the Borglums settled in the small frontier town of Fremont, Nebraska. Most of the kids in Fremont owned horses bought from the Pawnee Indians at local auctions. Gutzon’s lifelong love of horses began when he bought a Pawnee pony for fifty cents. The seller told Gutzon that he got a bargain; the pony was worth sixty-five cents. Years later, the horses that Borglum painted and sculpted were so lifelike they seemed ready to charge from the canvas or leap from their marble pedestals. Gutzon’s ability to bring paint and stone to life was discovered in an unusual way. The kids of Fremont attended a one-room school. Gutzon found the map drawing of the fifth graders more interesting than his third-grade reading was. The teacher warned Gutzon that if he didn’t pay attention to his own work, he would have to go to the blackboard and show the class how well he could draw a map of Nebraska. Gutzon still found the map more interesting. The teacher sent him up to the blackboard. Frightened and embarrassed, the young third grader began to draw on the blackboard. The other kids watched in amazement as Gutzon drew his first work of art. If maps could be so much fun, what about all the other things that filled his eyes and mind? Gutzon cleared a corner in the cellar at home and, with a box for a desk, began to draw. He covered every scrap of paper he could find with sketches, especially sketches of horses. His stepmother worried that all those hours spent scribbling were being wasted. She worried that Gutzon would never amount to anything. His report cards were poor, but among all those low grades, there was always an “A” in United States History. Gutzon seemed to find the story of his country as exciting as drawing. In time, the two would come together for him. When Gutzon was ready for high school, his father sent him to a boarding school in Kansas. For the first time, he found teachers who didn’t think it was a waste of time to draw pictures. Gutzon was surprised to hear them suggest that he choose art as his life’s work. After his graduation from high school, Borglum moved to California. He rented a small studio and spent all his free time painting. Soon all the walls were covered with portraits, landscapes and, of course, paintings of horses! People came to the studio to look and usually left with a painting they bought. One visitor to his studio was Jessie Benton Fremont, wife of the famous explorer, General John C. Fremont. It was Borglum’s paintings of horses that caught her eye. Mrs. Fremont sent many of her friends to Gutzon’s studio to buy the young artist’s paintings. She urged him to polish his skills by studying art in Paris—the art capital of the world. In 1890, Borglum sailed for France to learn more about art. As his ship moved out of New York harbor, he had his first look at the Statue of Liberty. As he studied the statue, he thought of what a wonderful feeling it would be to create a great work of art that would last an eternity. In Paris, Gutzon met the great French sculptor Auguste Rodin, who encouraged him to try his hand with clay and stone. 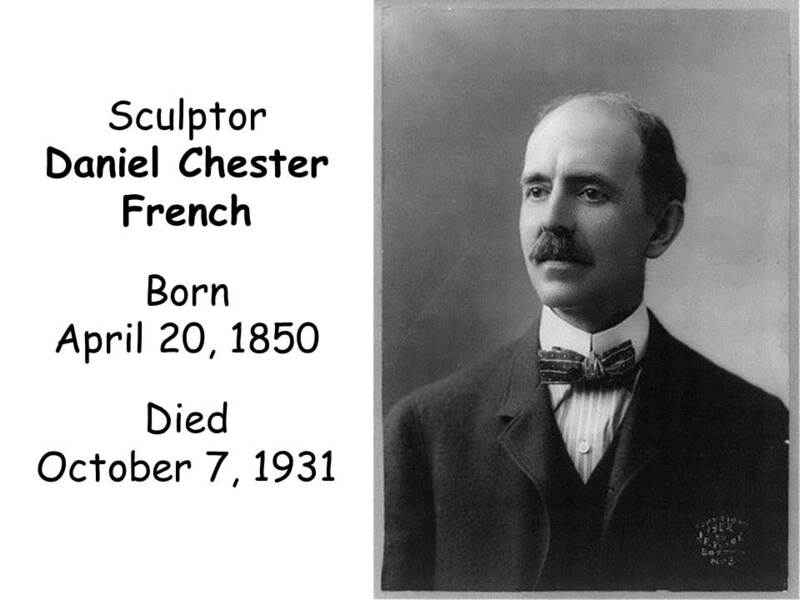 Gutzon studied sculpture under this famous French Master. Soon his sculptures were winning even greater praise than his paintings. He returned to the United States in 1901, confident that he had found the art form best suited to his purpose. The three great loves of Gutzon Borglum’s life—Art, United States history and horses—began to come together in his work. During the next 15 years, Borglum sculpted some of the great figures of United States history. His statue of Philip Sheridan, the Civil War General, mounted on horseback, was placed in Washington, D.C. His bust of President Lincoln was set in the rotunda of the capitol building. Yet, Borglum wasn’t satisfied. “The greatest stories of the world, the stories of our country, go unrecorded in our public parks and galleries,” he said. 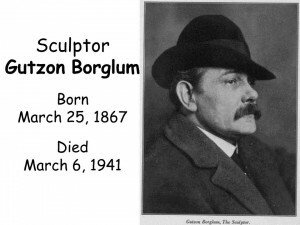 Borglum was a competent sculptor, but a difficult person to work with. 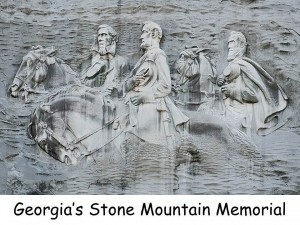 He had begun the sculptures of famous Confederate leaders on Stone Mountain, in Georgia, but he was fired from that job because he was hard to get along with. 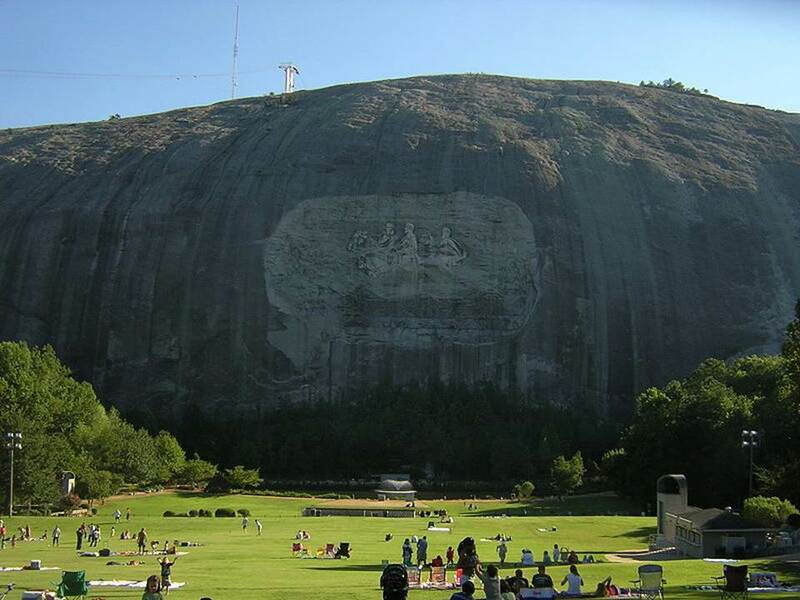 In retaliation, Borglum destroyed all of his models for Stone Mountain, which set back the completion of the project by 50 years. However, Gutzon had the experience from his beginning work on Stone Mountain, and the talent, to carve a great monument on Mount Rushmore. At first, Borglum made five-foot plaster models of the four Presidents. 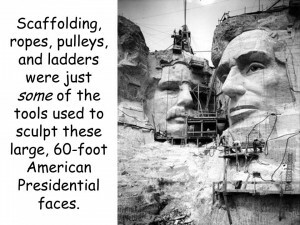 He made careful measurements to get the proportions right for the 60-foot faces on the mountain. Work began on the rugged granite of Mount Rushmore in October 1927. Originally, the plans called for waist-length carvings, but the lack of time and money prevented that idea from being completed. The first step of the project was to blast tons of rock off the mountain. This was a dangerous job that required engineering expertise. Borglum used a sort of swing for workers to be lowered down the face of the mountain as they did their work. Borglum watched from below with binoculars. Sometimes he rode up to the site in a small wooden cable car. Then he used a big paintbrush to write measurements on the rock. In spite of the great danger of this work, no one died on the project because of Borglum’s exacting safety standards. The texture and solidity of the granite rock posed some problems for Gutzon. Jefferson’s head had to be repositioned twice because of flaws in the stone. The second time, a crack in the rock posed a problem that Jefferson’s nose might eventually fall off. Borglum solved this problem by tilting Jefferson’s head, instead of starting all over again. Getting money to finish the sculptures was always a problem. Most of the money came from the federal government, but the fact that the work was done during the Great Depression meant that financing was scarce. The work had to be stopped several times because of lack of funds. More than two million tourists visit Mount Rushmore each year. The site is especially popular from Memorial Day to Labor Day. During this period, the sculptor’s studio is open. Visitors can see Borglum’s models and some of his mountain-carving tools. At night, there’s a show in the outdoor theater. The gigantic heads—as tall as a five-story building—are lit up against the black sky. The effect is breathtaking. How long will these colossal sculptures last? Granite is a very hard rock, but nothing lasts forever. The heads are wearing away at the rate of one inch every 5,000 years. To prevent damage, repairs are made regularly. Cracks are closed up before water can get inside and freeze. In 1990, geologists studied the monument to see how it was holding up. All four of the famous presidents are aging well. Lincoln’s face has a crack across its 20-foot nose. Roosevelt’s face has a crack in its forehead. Yet, in general, the monument is stable.  An Alfred Hitchcock movie classic called “North by Northwest” has several settings with scenes of Mount Rushmore. Towards the very end of the movie, the bad guys chase the hero (played by Carry Grant) and a female FBI agent across the faces of the Presidents, where they almost fall. If you check out the movie to show this final scene (approx. five minutes long), kids will get a better perspective of the enormous size of Mount Rushmore. The places on the smooth rock surface, which show a textured area of several engraved looking lines, are where the holes were drilled to lay in the dynamite charges. Before turning on the movie, explain this to the class and have them look for these lines as they watch. If Gutzon was a difficult person to work with, why do you think his workers continued to work with him for the almost 14 years it took to carve Mount Rushmore? Kids should list their own opinions. • Draw and paint pictures of horses, the animals that Gutzon loved to paint. • Create horse pictures using cut or torn construction paper shapes. Compare the Basic Elements of SHAPE (2-dimensional) and FORM (3-dimensional) before beginning. • Use clay to create a bust (sculpture of the upper part of a human figure) of the President. • Uses scissors and gray paper to layer SHAPES and create a paper version of a mountain rock carving. Create a monument to anything you would like! • Mount Rushmore was carved from a granite mountain. This was an example of SUBTRACTIVE SCULPTURE–material was taken away from the mountain to create the sculpture. Create subtractive sculpture by carving a plaster rock. Mix thoroughly: one-part plaster of Paris, one-part water and one-and-one-half-parts vermiculite (inexpensive, found in gardening sections) in a large container. Pour mixture into small milk cartons. Set aside to harden for 5-7 days. Peel carton off block. Have kids prepare a simple sketch for their block carving—areas to remain smooth and flat, areas to be hollowed out. The sketch can be transferred to the block with a pencil. Keep the design simple! Begin with the largest shape—gouge, file, cut and saw the block to the desired shape. This recipe makes a lightweight block that is easy to carve with a plastic knife and a toothpick and has the texture of real rock. Once carving is complete, sand rough edges and surfaces with medium sandpaper. Wipe with a moist towel. Sculptures may also be painted with tempera, watercolor or acrylic. This project will take advance preparation. Note: Plaster will clog plumbing! 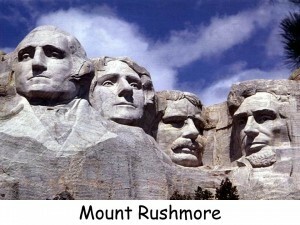 The Presidents on Mount Rushmore are even “larger than life”. George Washington led the colonial forces to victory in the Revolutionary War and also led a new American government as a limited term President, instead of as king, which was the position originally offered to him. America’s representational government was a new and different idea and Washington was a key person in its planning. Thomas Jefferson was the author of the Declaration of Independence. Abraham Lincoln led America through the most trying time of its history—the Civil War—and he helped define the freedom that America represents when he emancipated the slaves. Teddy Roosevelt helped bring about reforms in America that helped the workingman take care of his family. He was also an adventurous leader who helped found America’s conservation movement. The representation of these American leaders on Mount Rushmore reminds Americans of the best that our leaders can be and the important ideals that America stands for. • George Washington represents Democratic Leadership. He was a reluctant hero of the Revolutionary War. Washington brought dignity to the cause of American freedom. • Thomas Jefferson was a defender of Individual Freedoms. He was a philosopher and political leader. 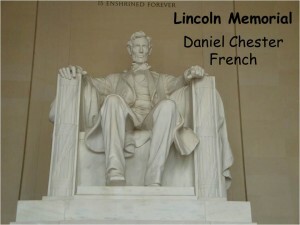 • Abraham Lincoln represents the strength of the American Union. Lincoln’s strength and courage helped save the Union of all the states. He also represents the right of ALL American citizens to be free. • Teddy Roosevelt represents the robust expansion of a nation and a commitment to preserve natural resources. Roosevelt was responsible for building of the Panama Canal. This canal allowed American ships to move quickly from the Atlantic Ocean to the Pacific. It gave the United States international influence. He also had Congress create National Parks at Crater Lake (in Oregon), Mesa Verde (in Colorado) and Wind Cave (in South Dakota). Theodore Roosevelt helped to preserve 125 million acres of America’s forestland. In 1885, a young lawyer, from New York, was visiting the black Hills of South Dakota for his company, which owned tin mines there. The lawyer’s name was Charles E. Rushmore. A local prospector was acting as guide to Mr. Rushmore on this trip. While Charles was admiring the view of a scenic granite cliff, he asked the prospector what the peak was called. The old prospector (who obviously liked the young lawyer) told Mr. Rushmore that the peak had no name, but that it would now be called “Rushmore” since the young lawyer had admired it so much and nobody else had named it yet. Fifty-six years later, Mount Rushmore was transformed, by an enormous engineering and artistic project, into an important and patriotic American Monument and tourist attraction. Charles E. Rushmore was asked for a donation to help fund this enormous project. He promptly sent a check for $5,000. Today, the name Rushmore is forever linked with the names of four great American Presidents. The Mount Rushmore Monument was created from a bare, massive outcropping of solid granite. Granite is formed deep inside the crust of the earth. Hot, molten, volcanic rock seeps up into the earth’s crust, where it slowly cools and crystallizes. The molten rock that creates Granite is never exposed to the air as it cools. GRANITE COOLS UNDER THE GROUND SO IT TAKES LONGER TO COOL than other forms of molten (or melted) rock. Granite forms crystals because it‘s able to take longer to cool. Crystals are what makes the granite sparkle. • Show and pass around some pieces of granite. Vancouver Granite Works (located across from Fort Vancouver High School at 5700 E 18th St.) sells small pieces of granite for as little as $3. Handley Rock and Jewelry Supply (located in Hazel dell, at 6160 NE Highway 99) is an additional place to find good examples of granite at an inexpensive price. Alternatively, allow yourself enough time to check out graveled areas (roads and parking lots) for a couple of FREE granite pieces. • Show and pass around pieces of basalt and let the kids compare it to the granite. The top of Mount Rushmore (where the presidential sculptures are) is smooth, solid granite. Over millions of years, the granite, which was formed under the earth, was pushed up to form mountains. The softer rock and dirt that was above and around the granite, gradually eroded away until the granite finally became exposed. This happened about 60 million years ago! However, the granite rock itself was formed underground, millions of years before that! Therefore, the rock that Rushmore’s presidential faces are sculpted of is very, very, very OLD! Most people choose their life’s work. Yet, sometimes a task seems to choose a person. That is what happened to Korczak Ziolkowski (COR chock jewel CUFF skee). Both of his parents, who were Polish immigrants, had died by the time he was a year old. Korczak grew up in a foster home. He never had an art lesson in his life but, in 1939, he won a major prize for his sculpture. Korczak also came to Mount Rushmore to work briefly with Gutzon Borglum. Later that year, Sioux Chief Henry standing Bear, wrote to the young sculptor, “The red man has great heroes, too,” he said. He invited Ziolkowski to carve a statue of Crazy Horse in the Black Hills. Ziolkowski felt honored. After World War II, Ziolkowski returned to South Dakota to begin this incredible task. Thunderhead Mountain would have an enormous figure of Crazy Horse, no matter how long it took. “Every man has his mountain,” Ziolkowski said. “I’m carving mine.” Crazy Horse had once told his people that he would return to them in stone. Now, with Ziolkowski’s help, he would. The statue is to tell about a story when a white hunter taunted Crazy Horse, after American soldiers defeated his people. “Where are your lands now?” the rude man asked. Crazy Horse pointed east and answered, “My lands are where my dead lie buried.” Ziolkowski’s design recreates this moment. It shows Crazy Horse, mounted on a horse, pointing toward the east, where many generations of Sioux have lived and died. From 1949 to 1982, this storyteller in stone blasted more than seven million tons of rock from Thunderhead. Yet, Crazy Horse did not emerge. On his deathbed, Ziolkowski told his wife and 10 children, “Crazy Horse must be finished … but go slowly, so you do it right.” He gave about 35 years of his life to the monument. Korczak hoped that Crazy Horse would be a source of Indian pride. The memorial’s goals include an Indian cultural center and a university and medical training center for Indians. Following Ziolkowski’s three books of instructions and using his scale models, family members have continued his dream. In 1991, Crazy Horse’s head finally appeared on the mountain. The face was completed in 2000. 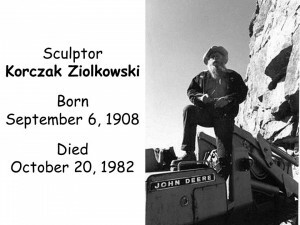 Ziolkowski’s family cannot say when the entire sculpture will be finished. Sometimes bad weather limits work to only five months a year. Financing is always a question mark. It could take another 50 to 100 years, but Ziolkowski’s family is determined to finish the job. Someday the great chief and his horse will stand in the round (in full sculptured form and not attached to a background), 563 feet high and 641 feet long. Crazy Horse’s head will be 90 feet high. The outstretched arm will be almost as long as a football field, long enough for 4,000 people to stand on. The horse’s head will be 22 stories high. A five-room house could fit in each nostril! It will be, of course, the largest sculpture in the world. As the work goes on, more than a million tourists a year stop by to watch. They also visit the Indian Museum of North America (run by Ziolkowski’s daughter) and the sculptor’s studio. Admission fees, plus private donations, are paying for the nonprofit educational and cultural memorial. Ziolkowski twice refused offers of $10 million in government funding. What keeps a person working so hard for so long on a very difficult, almost endless task? Here is how Ziolkowski explained it: “The world asks you one question, ‘Did you do your job?’ The answer is not, ‘I would have done it if the people had been nicer…if I’d had the money…if I hadn’t died.’ Ifs don’t count. The answer must be, ‘yes’” This is the spirit that carves mountains! 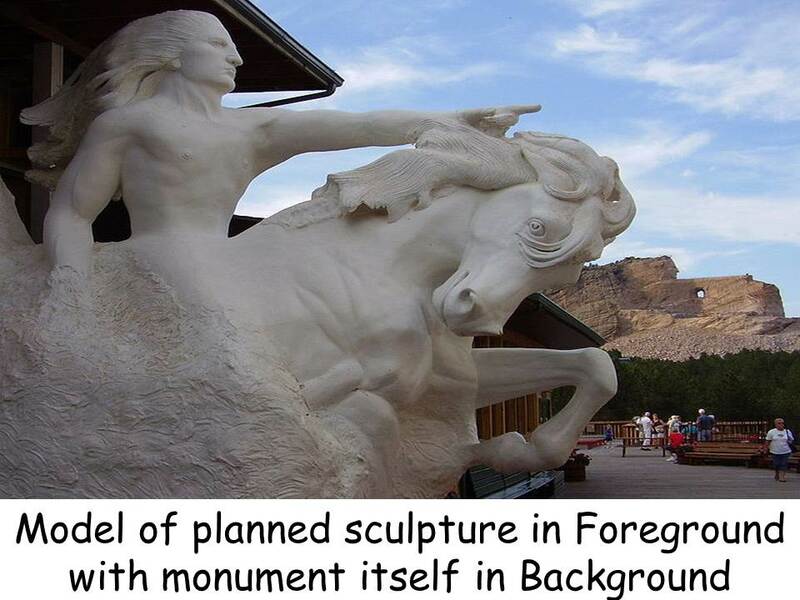 Crazy Horse was an Oglala (Lakota) Sioux Indian chief, who was probably born sometime between 1842 and 1844, somewhere near the mountain where his sculpture is now being sculpted. As a boy, Crazy Horse was named Curly. After Curly’s first great war deed, his father, who was himself named Crazy Horse, gave this name to his son. This was the greatest gift Curly’s proud father had to give his son—his good name. As a young warrior, Crazy Horse became known as a brave leader in battle. However, he was also generous in giving to others, modest about his deeds, and a quiet man who often preferred to be alone. Crazy Horse had light skin and hair and a quiet manner. No one knows for sure what he really looked like, because Crazy horse never allowed his picture to be taken. Once, when a white man asked to take his picture, Crazy Horse replied, “What? Would you imprison my shadow, too?” The Sioux thought he possessed unusual spiritual powers. They called Crazy Horse their “Strange One”. Gold was discovered in the Black Hills, in 1874. These hills are not really hills. They are mountain ranges. They aren’t really black, either. Dark pine trees on the slopes made the mountains look black from the plains below, so the Sioux call them Paha Sapa (literally “hills black”). The Black Hills were the home of the Sioux Indians. The U.S. government had signed Treaties with this Native American tribe, giving them this land. When gold was discovered in the Black Hills, prospectors swarmed all over this area, to dig for a fortune. The prospectors had no respect for Indian treaties. The prospectors ignored the fact that the United States government had given the Sioux the land. When the Sioux got upset over this invasion from these white men, army troops were sent in to protect the prospectors. In 1875, the United States government ordered Crazy Horse and other Sioux to enter a reservation—they refused. Crazy Horse was one of the ablest warriors to lead the Sioux in their attempt to stop the white man’s invasion of the Northern Great Plains. In 1876, Crazy Horse led the Sioux and Cheyenne to defeat General George Crook, in the Battle of the Rosebud, in Montana. Winning this battle forced the army to withdraw on June 17, 1876. Eight days later, along with the rest of the Sioux Nation, Crazy Horse led the Indians in the Battle of the Little Bighorn, where Lieutenant Colonel George A. Custer and his command were wiped out. There was no way any tribes of Native Americans could defeat the entire U.S. army. There were just so many more white people than Native Americans. Intense pursuit by the Army finally forced Crazy Horse to surrender in May 1877. On September 5, 1877, Crazy Horse was killed at Fort Robinson, Nebraska, by an army private while he was being forced into a jail cell. His family buried him secretly and never told where. Today, he is remembered for the great love he had for his people. Seventeen miles from Mount Rushmore, near Custer, South Dakota, a large Monument to chief Crazy Horse is being craved out of a mountain. When you look at the mountain, you can see the outline of a man on a horse. One day it will be a finished sculpture of Crazy Horse, the Sioux warrior who fought for his people. The Crazy Horse Monument was begun in 1947 and is still far from complete. It is much larger than the Mount Rushmore Sculpture. All four of the President’s heads on Mount Rushmore would fit into the head of Crazy Horse. At 60 stories high, this monument is the largest sculpture ever attempted by man. The Crazy Horse sculpture is actually more difficult than Mount Rushmore because, if it is ever finished, it will be a “full round” statue. 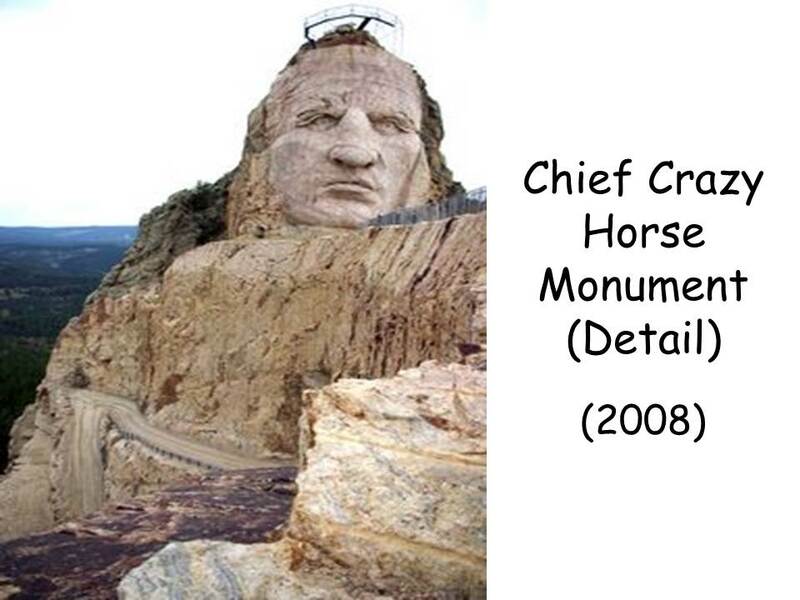 This means that the ENTIRE mountain will be carved away to form Chief Crazy Horse mounted on his horse. People can circle around and see Chief Crazy Horse from all sides. 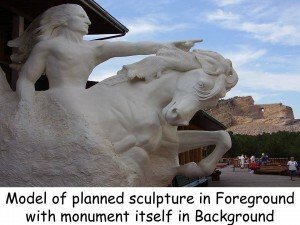 • Use clay to design what the Crazy Horse statue will look like or redesign how the statue should have looked. • Use clay to sculpt a running horse. • Discuss horizon line, foreground, middle ground, background, emphasis (center of interest). Using these basic elemental concepts, create a Landscape painting of the Crazy Horse Monument. 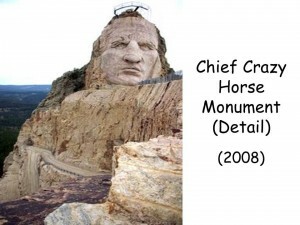 • Design your own monument to Crazy Horse and make a drawing of it. • Use cut or torn paper to form a 2-dimensional SHAPE of Crazy Horse. Discuss SIZE and proportion by having kids create small paper trees for the forest below Crazy Horse. Point out how very tiny the large trees will seem in comparison to the actual size of the finished monument. Discuss how the kids could create a smaller Crazy Horse and some larger trees if they give their pictures a different PERSPECTIVE. They could place Crazy Horse farther in the background (making him smaller) and put larger trees in the foreground, as if the viewer were standing close to the trees. Point out how things farther away from the viewer become smaller as things closer become increasingly larger (SPACE-relative size). • Design a monument of your own. What or who will it be dedicated to? How will you visually express the ideals you are memorializing? Remember, a monument to a person does not have to look like a person. 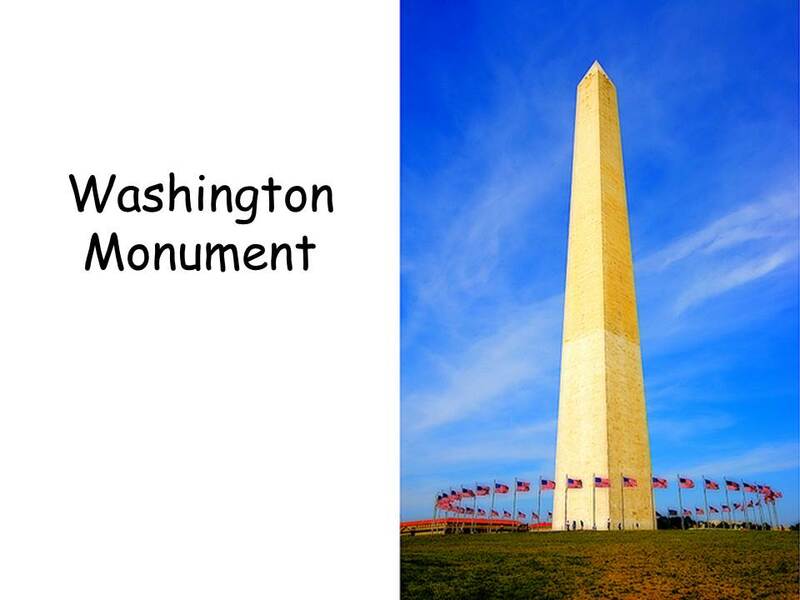 Think about the Washington monument. It certainly does not look like George Washington! The Vietnam Memorial is simply a black wall with the names of American soldiers who fought and died in that war carved into it. Who or what will your memorial represent and how will it be represented or “memorialized”? 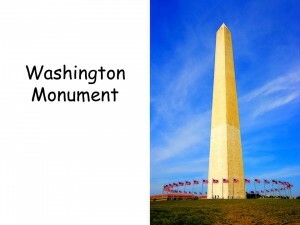 Draw what it will look like and write a paragraph about why you designed the monument this way and what it represents. The Lincoln Memorial is a beautiful marble building in Washington D.C., dedicated to the memory of President Abraham Lincoln. The statue inside the building is a huge figure of Abraham Lincoln seated in a chair. Lincoln is made up of 20 large pieces of marble, which are so carefully carved and fitted together that the statue seems to be all one huge piece of marble. The Lincoln statue is the only statue in the building. The inner walls of the Lincoln Memorial are decorated with huge paintings, but the whole building is made just to hold this one statue. Lincoln is seated in a strange kind of chair that looks like a throne. He sits facing the door, so that you stand in front of him when you enter. This is the largest marble statue in the world and most people believe it is a beautiful piece of sculpture. • The next time you look at a $5 bill, turn it over and you will see an engraving (picture) of the Lincoln Memorial. Can you find Lincoln’s Statue in this $5 Lincoln Memorial picture? The Minuteman statue stands on the Revolutionary War battlefield in Concord, Massachusetts. Where the statue stands, the road crosses a little wooden bridge over a stream. It was at this crossing that the New England farmers fired on the British soldiers—fired “the shot heard round the world”. “The Minuteman” was placed here to memorialize those early American colonial “farmer” soldiers. 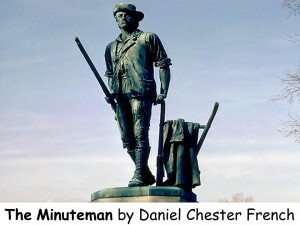 These soldiers were called Minutemen because they kept themselves ready to go to fight the enemy at a “minute’s” notice. The statue depicts a minuteman who is plowing as the call to arms comes and he leaves the plow in the field as he grabs his musket and leaves. 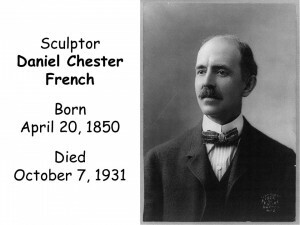 French was 23 when he created this statue and it was the first of his professional career. • The Minuteman statue is the symbol of the American National Guard today. 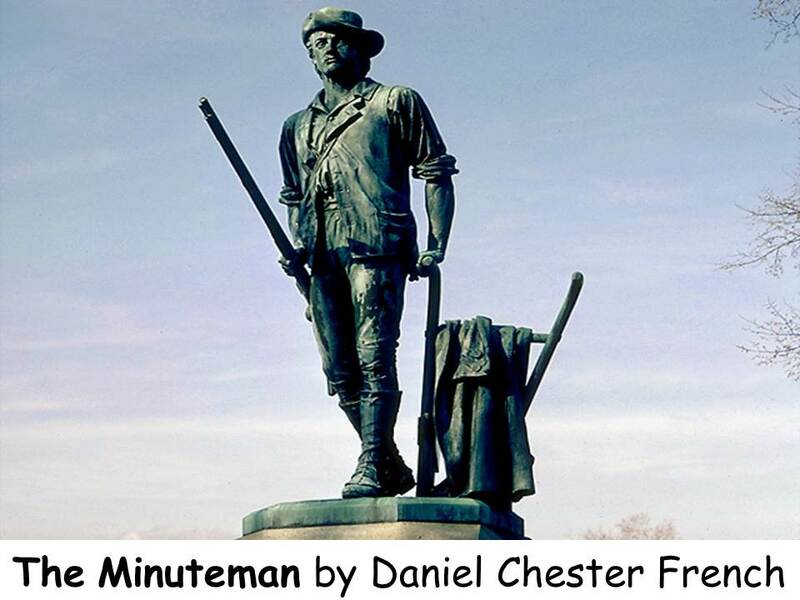 What do the soldiers of the National Guard and the Minuteman have in common? They have regular jobs and do not work for the military most of the time, but are expected to be the first called on to protect the United States in case of attack or problems (such as floods or hurricanes). They were/are both expected to gather their forces together quickly when called upon. • Check out the Massachusetts State Quarter.